This page provides support information on the Billion BiPAC 7800N modem router, which has now been replaced. The Billion 7800N gained a large following among broadband enthusiasts for delivering the very highest speeds possible from broadband connections due to its innovative target SNR margin adjustment facility and robust Broadcom chipset. New! See our latest router recommendations on our Which Broadband Modem Router? page. This page provides information on how to tweak the target SNR margin, manually select the modulation method and turn on advanced impulse noise protection to maximise your broadband speeds. The page also provides the Billion 7800N manual and a link to the latest UK firmware. We strongly recommend that you keep your Billion 7800N updated with the very latest firmware. The latest firmware version in the UK is 1.06h.dt2 (which was released in June 2014). This latest version of the Billion BiPAC 7800N firmware can be downloaded using the following link. 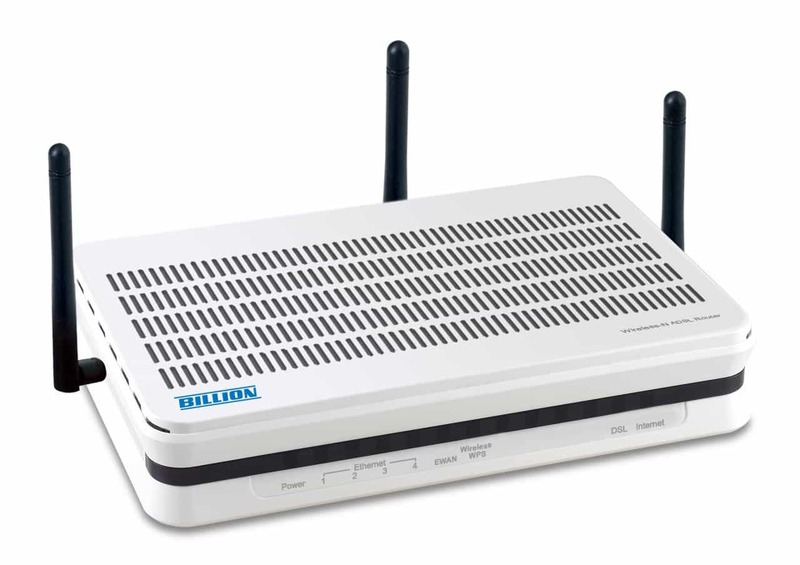 The reason why the Billion 7800N has been our recommended modem for several years is that it enables broadband users to extract the maximum speeds possible from their ADSL or ADSL2+ line. Those extra Mbps are particularly highly valued by people living or working in rural areas at relatively large distances from their exchange. Even broadband users living close to an exchange are often delighted to see substantial improvements in their download speed too. providing advanced impulse noise protection (although this is switched off by default). These are now discussed in turn. The most brilliant feature of the Billion 7800N is its ability to tweak the target SNR margin, which is described in detail on our Broadband SNR margin tweaking page. A great feature of the 7800N's target SNR margin adjustment capability is that any changes made survive a modem reboot. Despite the power of target SNR margin adjustment, most 7800N owners are completely unaware of this capability because it has not been heavily promoted by Billion and the target SNR margin adjustment is not part of the visible set-up menus. The Billion 7800N has a 'hidden' menu in its configuration, which you can access by adding 'snr.cgi' to the end of the URL you use to access the modem. So, if you currently access the modem by entering 'http://192.168.1.254', you should enter 'http://192.168.1.254/snr.cgi'. Depending on the current target SNR margin that your broadband provider has set for your line and the target SNR margin that you would like, you should enter the number according to the table below. Once you have entered the number, remember to press the 'Apply' button. You do not have to reboot the modem. Once you press the 'Apply button', the modem will resync with the exchange and you should experience an increased downlink connection speed. It's really that easy to substantially increase your download speed! If the table above is rather confusing, the table below presents the information in a different way. You start off with whatever your default SNR margin value is, and work your way down the table (to increase speed) until you find the optimum setting for your line. You can always reset back to the default value by using the number 100. Note that you can use values between those shown, but we wanted to avoid having a huge table! Please bear in mind that by increasing the speed of your line, you may make the line less stable. So, you'll have to work out the best target SNR margin for your own line. You will be able to use lower SNR target margins if you have interleaving switched on on your line. You can request your ISP to do this if it is not already switched on. Many broadband users are able to achieve a stable connection with a target SNR margin of about 3 dB. However, your line may be different. If you experience unacceptable line drops, you can simply change your target margin to a level that you are happy with and you will know that you're achieving the very best performance you can. What's particularly nice about this tweak is that settings are not lost when the modem is rebooted. While target SNR margin tweaking can substantially increase your broadband speeds, it is one of a number of techniques that can be applied, and you could get even better broadband speeds. Please read our free Increase Broadband Speed Guide for more information. As detailed in our Increase Broadband Speed Guide, all lines are unique and it is not always possible to reliably predict which modulation method – basic ADSL (G.Dmt) , ADSL2 or ADSL2+ – will yield the very best speeds and line stability. When the 7800N is left in its default setting, the modulation method is selected automatically. However, manual selection can potentially improve the speeds and stability. Users connected to ADSL equipment in the exchange can only select basic ADSL (G.Dmt). However, users connected to more modern ADSL2+ exchange equipment (also known as ’21CN’) have the choice of three operating modes – conventional ADSL (G.Dmt), ADSL2 and ADSL2+. Please read our ADSL2+ page for more information about the characteristics and benefits of ADSL2 and ADSL2+. We recommend that that you try each available operating mode in turn to see which one gives the best speeds and stability for your line. Many people do not realise that it is possible to select basic ADSL or ADSL2 on a line connected to ADSL2+ equipment. ADSL2+ does not necessarily given the best performance, particularly on longer lines. For example, for our own particular line, we have found that ADSL2 works best. On the Billion 7800N, it is very easy to select the modulation mode manually in the 'Advanced' ‘Configuration’ ‘WAN’ ‘ADSL Mode’ submenu. Here you simply tick the modulation type(s) that you want to be used. Ticking only one option will force the modem to use that particular mode to allow you to test its performance. Using a chipset from Broadcom, the Billion 7800N benefits from a new impulse noise protection technology. According to Broadcom, its PhyR (pronounced "Fire") technology delivers a ten-fold improvement in noise resilience against impulse noise and delivers a reduction in bit error rates. This feature was only made available in the firmware from 1.06b, and is not switched on by default. To switch on impulse noise protection, go to the 'Advanced' menu, then 'Configuration'. Then select 'WAN' and 'ADSL Mode'. This is the same menu as shown above for the modulation configuration. You need to tick the two boxes for 'PhyR' - for both upstream and downstream. Then press 'Apply'. We understand that the impulse noise protection does not work will all exchange equipment, although it does no harm being left on! The Billion 7800N is no longer available. Our Which Broadband Modem Router? guide gives you our latest equipment recommendations, including the very latest Billion models. Our Increase Broadband Speed Guide provides many tips on how to squeeze the highest speed possible from your line. Your WiFi connection may actually be the bottleneck for your broadband connection. Our WiFi Optimisation Guide helps you set up your WiFi to give optimum performance.